Obtaining copies of birth, marriage and death certificates. Obtaining copies of wills, grants of probate and letters of administration. In addition to family history research, Census Searches also specialises in locating missing heirs to unclaimed estates. Lord and Lady Teviot have themselves compiled The Sussex Burial Index covering the years 1813 to 1841, which also includes non-conformist entries. The fee for searches to be made in this index is £5, and covers up to ten searches of the same surname. 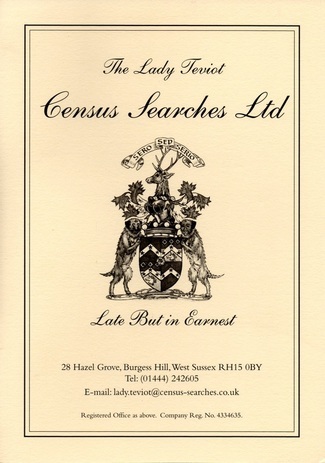 The service and fee is also the same for searches made using the Brighton Burial Index (which holds full entries for 1842 to 1854 as well as partial listings for the years up to 1893), and for those searches made using the Late Baptismal Index 1837-1871 which covers forty parishes including Brighton. The cost of preliminary research into your family history is usually estimated on the information that you can provide. No payment is required in advance, and the fee is payable only upon receipt of the research and report. Our organisation draws from over 25 years of experience in the genealogical field and provides a high standard of research within a competitive fee and costs system. I thought I should let you know that I have, at last, obtained British citizenship largely with the help of the research you did for me a few years ago. When I first tried to do this I was informed that it could only be done if the father was the British citizen. That changed a few years ago and now I’m one of you! Just have to get a passport now then I can be rid of these stupid visas. We generally have a few days stopover in London when we’re on our way to visit our son in Boston USA. We should try and see you the next time we go over. Let us know if you would like to see some grubby South Africans sometime! Thank you so much for the results of your family history searches for my mother's 80th birthday present, she will be absolutely delighted and enthralled by all the information. J L.
Intestacy or Probate Research is undertaken by companies when a person dies without leaving a will. They specialise in tracking down relatives of the deceased who unless found the Unclaimed Estate will go to the Treasury. With a shifting population and busy lives families now very often lose touch with each other. They will have no idea they are entitled to a share in the Estate of their deceased relative sometimes not even being aware of their existence. Census Searches Ltd has undertaken research not only for solicitors in the UK but has also been retained by Trustees in the U.S.A, Australia and Canada.